Audi really likes its “e-tron” name. For years it’s been used to designate hybrid cars like the current A3 e-tron, as well as more experimental endeavors like the electric R8 e-tron that was just quietly killed off. But the name’s biggest deployment to date will be on Audi’s first all-electric crossover, with no other numbers or letters attached. Autocar reports that in a sort of homage of homage to the original Quattro, which later was used to denote its all-wheel drive systems, the Tesla-fighting electric crossover will just be called the Audi E-Tron. Or rather Audi e-tron, if you think that stylized capitalization is “hip” and “cool” like the brands do. Anyway, Audi boss Rupert Stadler told the magazine that in the long term more electric and hybrid vehicles will carry the e-tron badge—A6 e-tron, A7 e-tron, and so on—but the SUV will bear that name alone. 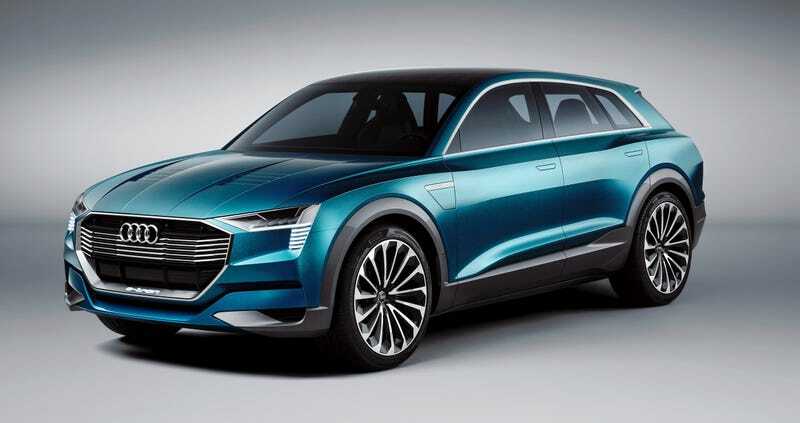 And it should look like the e-tron Quattro Concept we saw last year. It’s a big deal product for Audi, which along with corporate cousin Volkswagen is planning a big electric onslaught as it recovers from the global diesel cheating scandal. And clearly, Audi has its sights set on Tesla with this emerging luxury electric lineup. E-tron! Get used to hearing that name a lot more. I just wish they could have found a way to make the electric R8 work as well.